Millions of people around the world know Chuck Norris as the star of more than 20 motion pictures, including Delta Force, Missing in Action, and Return of the Dragon. Millions more know him as a martial arts expert, the only man in the Western Hemisphere to hold an 8th degree Black Belt Grand Master in Tae Kwon Do. And then there are others who know him from his eight seasons on CBS's longest running series, Walker, Texas Ranger. What many don't know is that Chuck Norris is a sincere Christian, a man whose faith plays a role in everything he does. Against All Odds is an inspirational story of how Norris overcame abject poverty from childhood, the effects of his father's alcoholism and desertion of the family, and his own shyness and lack of strength and ability early in his life. Norris writes candidly about how he was able to overcome such obstacles in his life, giving full credit to God. Chuck comes across as a pretty nice guy, meek and reasonable. If you like his movie and want to know more this is not a bad choice. I'm a long time martial artist and fan of Chuck Norris for many years. I have always wanted to learn more about his life and decided to try this book. Although the book was interesting on some level, I feel the combination of poor writing and an even worse performance made it hard to get through. The second half of his book mostly concentrates on his life successes and belief in Jesus. As a whole I found it to be very disappointing, save your credits and read his wiki page instead. I was pleased to listen to this book and was more engaged to it the further it went. It's nice to get some of the back story and learn about the fantastic luck and hard work that has given rise the legendary man that we know from work such as Walker Texas Ranger. I really enoyed this book too. When Walker Texas Ranger was on TV I watched it all the time. After hearing this book. I have even more respect Chuck Norris. I wish there were more men like him. men that would respect women. God broke the mold when He made Chuck. This is such a good book. I would give it a 10+ if the rating went that high. I must be getting jaded. I love historical and bio/autobiographical books, but when they put them down on audio, something gets "lost" in the translation. In this case, I think it's the narrator. I get that he's the author's son, but man... definitely NOT cut out for this kind of thing. Still, it's better than some of the other books I've listened to that are akin to fifth grade film strip audio. The content is great, especially after listening to a book about Bruce Lee and his dealings with Chuck, but the choice of narrator could have been a little better. Definitely worth a listen, though. Good story, but should have "I"m going to preach to you" warning. Maybe better in a Christian bookstore. Chuck Norris is an Amazing Man, and role model. Amazing book about a great book, Christian, and and an example for all of us. He has helped me through his books many times. Loved it! My Son and I listened to it intently. What a blessing he is to the Martial Arts World. Excellent Story filled with real life. Great story. Love Chuck Norris. Chuck Norris is a inspirational and positive role model for us all. I really enjoyed his story and found myself wanting to hear more when it was over. Would you listen to Against All Odds again? Why? 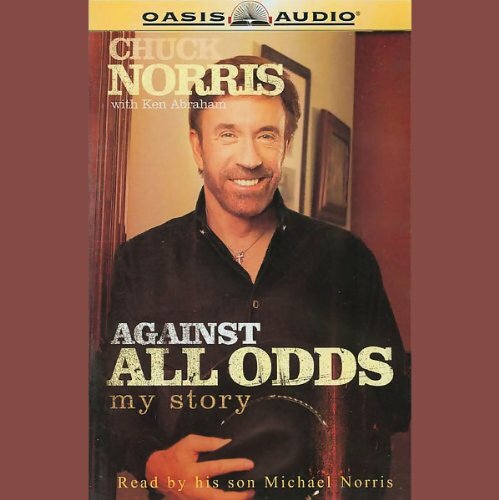 I would listen to this book again, because Chuck norris is plays my favorite character on a television series, and I think that his story is great. It explains a lot when you consider most of the episodes of Walker, Texas ranger are touching, and family oriented just like norris's life is like today. What was one of the most memorable moments of Against All Odds? I would have to say when Norris comes out of his shell when he learns the martial arts. He states, and I agree that it makes you feel good about yourself when you know you can stay away from vices just by doing something positive. Which character – as performed by Michael Norris – was your favorite? Mike does a great job just telling his father's story. There were parts of the book that made me a little emotional, but the part I found funny most of all was the part where Bob Barker beats Adam Sandler, andChuck laughs and smiles at how well he taught Barker.